How to Fast Rip and Stream DVD Movies to Amazon Fire TV on PC/Mac? New products are always on the forefront of every tech aficionado's mind. Amazon Fire TV, a brand new TV box after Apple TV and Roku, was unveiled and available for purchase since April, 2014. It takes only one year to gain a foothold in the TV box field and Fire TV has been out of stock in Amazon's own store since August, 2015. Of course you can stream online audio/video content to your local HDTV, eg. 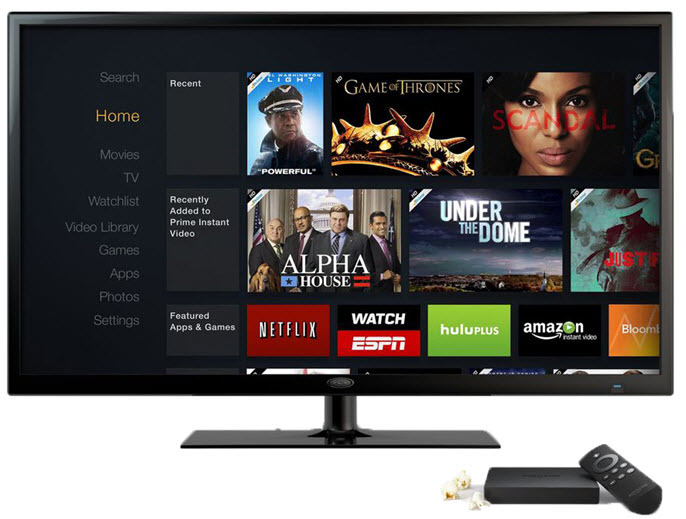 Netflix, Amazon Instant Video, Hulu Plus, YouTube, and HBO GO to Amazon Fire TV connected HDTV for instant viewing, playing games/music and more are also easy for you, while playing DVD on Amazon Fire TV is still out of the question. • Install the DVD to Amazon Fire TV ripper on your disk: Download ripper on your computer (Windows or Mac one), double click the setup file following the Wizard, select a language as you like and finish the setup. 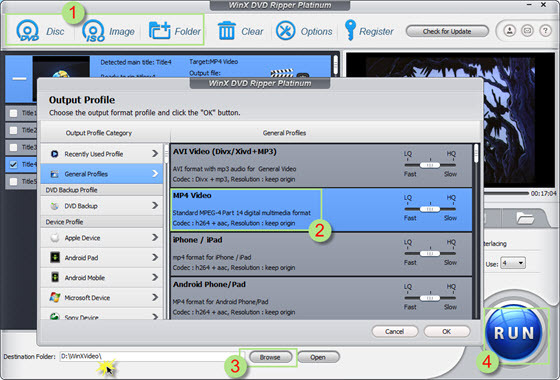 Launch ripper, click "DVD Disc" button on the top toolbar to select and load the source movie DVD disc. It can also transfer your ISO Image file or DVD (VIDEO_TS) folder to a Fire TV video. Fire TV supported video/audio includes H.263, H.264, MPEG4-SP, VC1 & AAC, AC-3, E-AC-3, HE-A/, PCM, MP3. Therefore, we can select the output video format according to the above official specs. Above all, MP4 (H.264 + AAC codec) is recommended to you for better compatibility with more devices, and choose it at "General Profile" category. What's more: WinX Ripper has preloaded options for other Amazon products, like Amazon Fire Phone, Kindle File (HD/HDX) Pad, and more Apple Android Sony Microsoft gadgets. You just need to click the "Browse" button at the bottom to "select folder" for saving the movie video in where you choose. Generally, folder in Disk C is not recommended to place the file. Since Fire TV supports expendable USB storage, you can also plug in the USB flash drive and select it as the destination folder, which helps to saving time of copying & pasting if necessary. Editing DVD video, choosing/adding movie subtitle, adjusting video/audio parameters (eg. changing DVD video resolution to 720 * 480, 1280 * 720 etc., or resetting the aspect ratio). Although Amazon Fire TV supporting adding external USB storage, Fire TV can not play movie/music videos in USB flash drive like Roku. So you can only depend on the airplay or stream services. • Stream digital movie video from Kindle Fire HDX or some other devices like HTC M8, Nexus 7 and more Android devices to Amazon Fire TV fast and easily with streaming app, Plex media server etc. • Install and upload movie DVD video to Amazon cloud drive and then play DVD movie on Amazon Fire TV by taping: Home -> Photos -> Select. 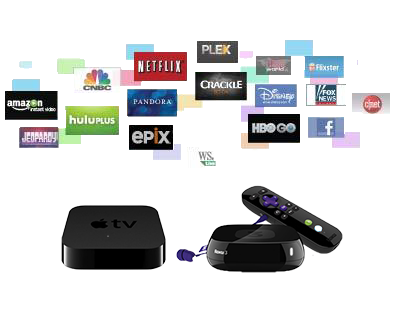 Of course, the Fire TV does have some competition, especially from Apple and Roku, which have their own streaming box solutions, but also have their own downsides. Rip and digitize homemade, scratched, movie DVDs / folder / ISO image and DVDs with 99 titles - the new DRM encryption adopted by Disney and other DVD distributors, bypass DVD CSS, region code, Sony ARccOS, UOPs, APS, RCE, level-3 hardware accelerated. It is not simply a guide on how to convert DVD on PC/Mac for streaming the digital copy to Plex, Roku, Chromecast, My Cloud. If you can't rip a Disney DVD with HandBrake, check whether the DVD is copyrighted since HandBrake won't rip protected/encrypted DVDs. Can't rip DVD with 99 titles problem is solved here. This post will help rip and copy DVDs with 99 titles copy protection to MP4, MOV, AVI, FLV, etc. on PC/Mac.